The weather has been gorgeous here in the UK recently and I've been loving making outfits with the summer in mind. I love this all-white outfit with the lilac, especially the way my new Motel body looks under this sheer t-shirt from Topshop. When Sammy Dress contacted me I really was spoilt for choice on their site, I'm usually quite intimidated by wholesale sites like their's but after looking through the items I found so many pieces I wanted, from chunky knits to fur jackets! In the end I opted for these faux leather shorts which are a complete bargain (compared to many other versions on the high street), they look amazing with pastels like this but also really chic with breton stripes and heels! 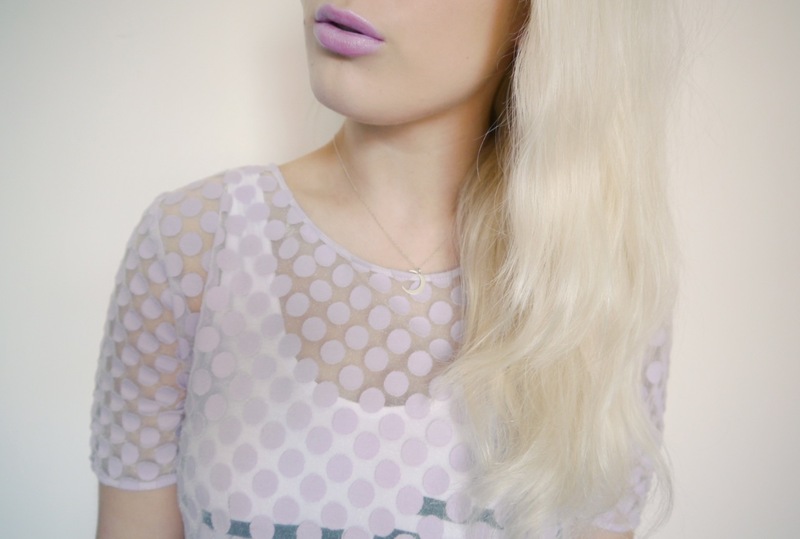 Pretty love this lip colour! Omg Ellen, I have just found your blog and your style is so so lovely. Beautiful, I love the top! Gorgeous! Your makeup is flawless! the lipstick looks so lush on you, wish I could wear these colours! Totally lusting after that sheer top, it's gorgeous!